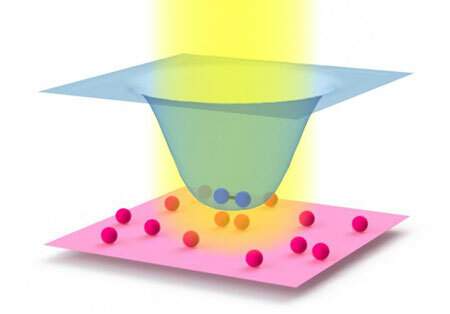 (Nanowerk News) Physicists have wondered in recent years if they could control how atoms interact using light. Now they know that they can, by demonstrating games of quantum billiards with unusual new rules. In an article published in the Oct. 5 issue of Physical Review Letters ("Quantum Dynamics with Spatiotemporal Control of Interactions in a Stable Bose-Einstein Condensate"), a team of University of Chicago physicists explains how to tune a laser to make atoms attract or repel each other in an exotic state of matter called a Bose-Einstein condensate. "This realizes a goal that has been pursued for the past 20 years," said Cheng Chin, professor in physics at the University of Chicago, who led the team. "This exquisite control over interactions in a many-body system has great potential for the exploration of exotic quantum phenomena and engineering of novel quantum devices." Many research groups in the United States and Europe have tried various ideas over the last decade. It was Logan Clark, a graduate student in Chin's group, who came up with the first practical solution. He has now demonstrated the idea in the lab with cesium atoms chilled to temperatures just billionths of a degree above absolute zero, and the technique can be widely applied to other atomic species. Clark compared the process to a billiards game, when one ball encounters another. "Normally, as soon as the surfaces touch, the balls repel each other and bounce away," Clark said. In Chin's lab, cesium atoms replace the billiard balls, and ordinarily they repel each other when they collide. But by turning up the laser while operating at a "magic" wavelength, Clark showed that the repulsion between atoms can be converted into attraction. "The atoms exhibit fascinating behavior in this system," he said. By exposing different parts of the sample to different laser intensities, "We can choose to make the atoms attract or repel each other, or pass right through each other without colliding." Alternatively, by oscillating their interactions, analogous to making the billiard balls rapidly grow and shrink while they roll, the atoms stick to each other in pairs. The researchers explained two fundamental ways that lasers influence the atomic motion. One is to create potentials, like a bump or valley on the billiard table, proportional to laser intensity. The new way is to alter how billiard balls collide. "We want our laser to control collisions, but we don't want it to create any hills or valleys," Clark said. When the laser is tuned to a "magic wavelength," the beam creates no hills or valleys, but only affects collisions. "This is because the magic wavelength happens to be in between two excited states of the atom, so they 'magically' cancel each other out," he said. Magic is a concept that has no place in science, though the word does enjoy fairly common use among atomic physicists. "Generally it is used to refer to a wavelength at which two effects cancel or are equal, in particular when this cancellation or equality is useful for some technological goal," Clark said.